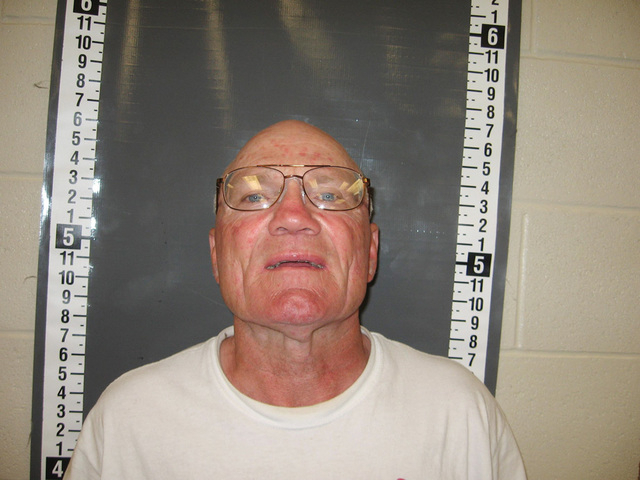 Nye County Sheriff’s deputies arrested a man on child abuse charges. Local resident Jeffery Michael Rhoden was taken into custody after Pahrump Valley High School administrators contacted authorities last Thursday morning. The faculty member called authorities after noticing the teen’s right eye was swollen. When a deputy arrived, she also observed the teen’s injuries. After speaking to the student, it was determined that the juvenile had been in a verbal altercation with his father that turned physical. After the verbal argument, the boy went to his bedroom and closed the door. The teen said he was leaning up against the door when his dad busted the door open. In her report, the deputy stated that she noticed some redness as well as a few abrasions on the teen’s arm. The deputy also stated that the father used a “metal stand” against his son, causing further injury. “He stated that his dad picked up a metal stand and started pushing it at his son’s body. The teen said that the right side of his ribs hurt because he was injured there by his dad. He also stated that his dad had punched him in the eye which caused the swelling,” the deputy’s report stated. Rhoden was subsequently arrested without incident and transported to the Nye County Detention Center on child abuse charges. Nye County Sheriff’s Deputies arrested a man last Thursday after security guards at the Pahrump Nugget Hotel Casino said the individual planned to blow up the popular gaming establishment. The man, identified as Robert Allen Hinckley, was charged with communicating a bomb threat just after 4 p.m. According to an arrest report in the case, the suspect asked a security guard when his days off were. “The guard informed the suspect what days he had off, at which time Hinckley appeared to be happy and told the guard that he didn’t want him around when he blew the place up. The guard said he was waiting for Hinckley to say he was joking but he didn’t. The guard then asked if he was joking and Hinckley told him yes, but in fact, he did ‘have a plan for this place,’ referring to the casino,” the report stated. The guard then approached another casino security guard and informed him of the incident. Sheriff’s deputies were notified as well. Both men approached the suspect again to find out exactly what his plan was. “The guard stated that Hinckley didn’t want to reveal his entire plan because the guard was the ‘enemy’ for working for the casino,” the report stated. After being approached by sheriff’s deputies, Hinckley was detained for his own safety all the while saying that the casino should be blown up. “Hinckley also stated that he never said anything about a bomb. He also said that if he wanted to do it, he would not have told us and just did it. Hinckley at one point also said he was just joking. It should be noted that Hinckley has had previous adverse contact with Nugget staff prior to this incident,” McRae noted in his report. Deputies didn’t seem to find the humor in Hinckley’s joke and he was eventually arrested and taken into custody without incident.